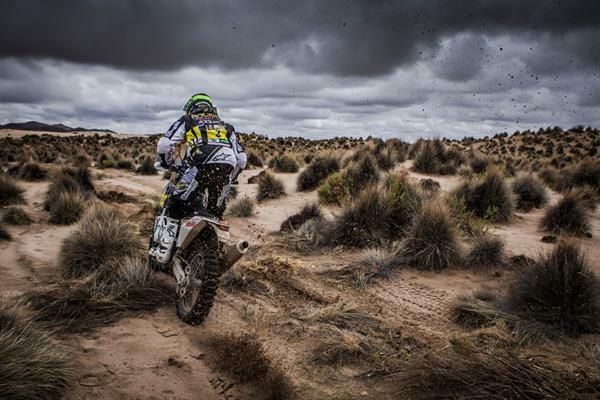 On a day where Rockstar Energy Husqvarna factory riders Pablo Quintanilla and Pela Renet had to exercise extreme care with their FR 450 Rally bikes and tires because of the Dakar Rally marathon stage, both arrived safely at their destination at Uyuni (Bolivia) after the seventh stage. Pablo Quintanilla hung onto his overall second position after riding out the stage in ninth place. Pela Renet was 11th but advanced one place in the rankings to seventh overall. The stage win went to American Ricky Brabec and as every completed stage so far has produced a different winner, it remains impossible to speculate about the end result next Saturday in Buenos Aires. Quintanilla, of Chile has continued to concentrate on careful and consistent rides and took the same approach in the re-shaped stage seven, quickly drawn up by race direction on Sunday’s rest day. It included elements of the sixth stage that was washed out on Saturday and the 161 km timed special was in the sand, high on the Bolivian Altplano. This, and the additional liaison rides of another 640 km saw competitors on their bikes for another long day. Quintanilla’s time loss of 10.28 minutes in the stage was probably tactical to ensure he made it safely to the overnight bivouac. He is now 17.45 minutes behind overall leader Sam Sunderland but as riders admitted on the rest day, the worst is probably still to come. Renet finished the stage in eleventh 12.35 minutes behind Brabec but still moved up a place in the overall standings. On Tuesday both riders have to continue to look after bikes and tyres to make it back to their support teams in good shape when they reach the overnight stop at Salta, back in Argentina. There they will be back in the hands of their mechanics and staff. Dakar rally rules state that there can be no assistance from the teams at the overnight stop of the marathon stage. The rally has continued to throw up surprises on its way through Paraguay, Bolivia and Argentina. Friday’s stage five was shortened when riders were deluged with heavy rain, which ultimately resulted in the cancelation of the sixth stage, which was to be the longest and most complicated. Teams however received a tumultuous welcome by the thousands of Bolivian fans, who braved the bed weather rain to welcome them in La Paz. Sunday was the one scheduled rest day, and race direction used to reshape the seventh stage, which then took in parts of the previously uncontested sixth stage. The overnight stop was Uyuni, close to Bolivia’s border with neighbouring Chile. On Tuesday they travel to Salta, and while the Dakar has been there before, organizers have promised it will be approached in a very different way. They warn that there will be many rivers to cross and that they will pass through spectacular canyons in Tuesday’s eighth stage.